Simple, Plug in X10 Signal Repeater that works. Almost every home has some form of line noise. 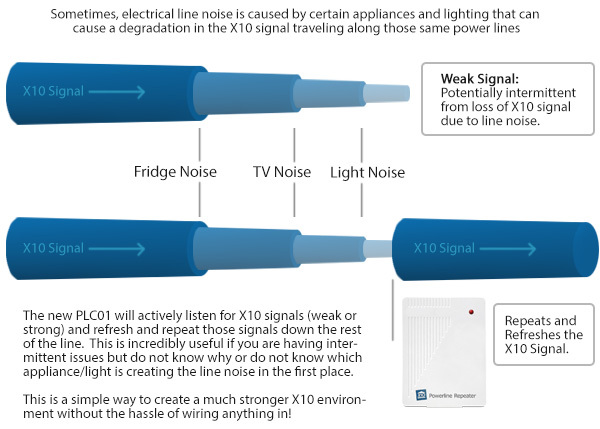 Occasionally, there can be so much noise that it can weaken the X10 signal to the point that it cannot be received by the receivers throughout your house. Sometimes it can be very hard to track down what exactly is causing the noise. If you are suffering from line noise or intermittancy with your system, try out this plug in repeater. It is ultra simple to install. Simply plug it in and enjoy your hassle free Home Automation! The unit is small and can plug into any outlet. It also has a passthrough outlet so you are not wasting an outlet having it plugged in! Try moving it around from outlet to outlet until you find the optimal placement to beat the line noise.